Add these stunning sculptures to your collection for a bold and unique touch. 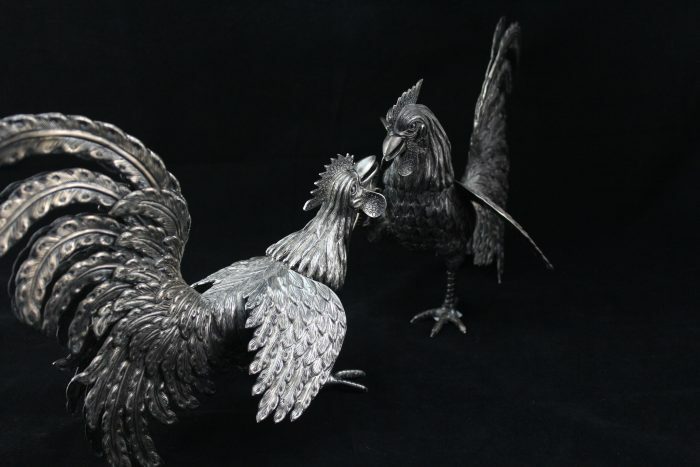 This pair of sculptures is made out of sterling silver and feature intricate details! They depict two fighting roosters. One rooster is keeping low to the ground with his head up and break open, Both of his wings are out. The second rooster is ready to fight, with his foot up and wings open wide. They are in great condition with very little surface wear due to previous use.